A specialist in veterinary ophthalmology, Dr. Federica Maggio was inducted into the American College of Veterinary Ophthalmology in 2005. She has authored numerous ophthalmology articles that have appeared in the Journal of the American Veterinary Medical Association, the UK Veterinary Journal, Veterinary Ophthalmology and Veterinary Clinics of North America—Small Animal Practice. Dr. Maggio's most important contribution has been her research on systemic hypertension and associated ocular lesions in cats. Her main current focus is glaucoma, cataract surgery and reconstructive eyelid surgery. 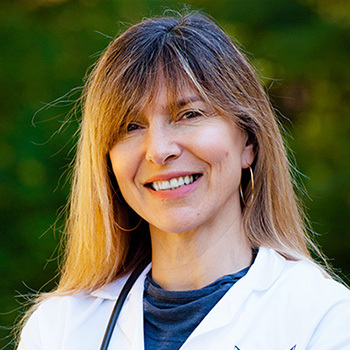 Born and raised in Italy, Dr. Maggio attended veterinary school in Bologna and graduated with her Doctorate of Veterinary Medicine in 1991. Following veterinary school, she completed a residency program in veterinary ophthalmology at North Carolina State University in 2004. Since then, Dr. Maggio has been teaching ophthalmology at the Cummings School of Veterinary Medicine at Tufts University and practicing ophthalmology at Tufts VETS. Dr. Maggio is married to Dr. Stefano Pizzirani, a veterinary ophthalmologist, and they have a son, Teo. During her leisure time, she enjoys cooking, reading, running, watching movies and playing with her cat Nina and her Cairn terrier, Mushu.